UK-based start up Capify is introducing a range of NFC-enabled baseball caps. “The idea of integrating NFC into a cap came from a brainstorm around NFC and how it allows you to connect the real world and the virtual world in a seamless, amazing way,” Capify’s Robert Wingrove has told NFC World. “I was talking to a colleague about how NFC enables you tell more of a story about yourself or your brand or your interests and then we started thinking about the everyday items a person carries and what those items say about you. “We then started thinking about fashion accessories and realised that a cap is much more than a functional thing you wear on your head. It is an extension of you and your personality. We thought why not take this expression to the next level with a product like Capify? “In terms of target customers we have two types of users we are focussing on. A cap as a fashion accessory appeals to an extremely broad audience, that encompasses many different tastes and demographics. It’s this flexibility as a fashion accessory that appeals to us since a hip hop fan from Brooklyn would be equally at home in a cap, as a middle age baseball fan from Minnesota. Capify is aiming at two markets for its NFC baseball caps, Wingrove explained: Direct to consumer and commercial/content partnerships. In the commercial arena, for instance, Capify is looking to set up deals to provide exclusive, one-off content through the cap for high visibility brands. “We feel that linking the hat to exclusive content or usability (like being able to receive discounts at a sports stadium) means we would broaden the appeal of the hats away from just a niche audience like our direct to consumer proposition and take this to all types of users,” says Wingrove. 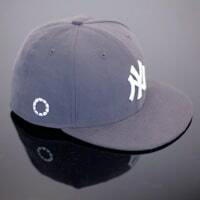 Capify baseball caps are available to pre-order at US$39.99 each from NFC specialist Flomio.